On our site you will find gifts of distinction for people of taste and humour. We stock items which are in themselves quite unique works of art. Below is a brief description of our product range. These beautiful ceramic guinea fowl are hand-decorated and imported from the Provence Region of the South of France. They are the special creation of Les Ceramiques de Lussan. In France they are known as Le Pintarde. The forms are timeless and serene. The glazing, colors and decorations are subtle and lovely. 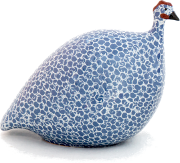 These beautiful ceramic guinea fowl are hand-decorated and not enamelled. These ceramic quail (like the ceramic guinea fowl) are hand-decorated and imported from the Provence Region of the South of France. They are available in two sizes/styles: Upright or Pecking. They look best as a pair. We are the official dealer in Gloucestershire for the Frogman collection of Tim Cotterill. Elegant, stylish, unique and pure fun frogs. The frogs are cast in solid bronze then a six step process creates the final jewel like patina. This is the art of Tim Cotterill. This is a unique gift for the horse racing enthusiast. Have your own personal colours hand-painted onto a miniature jockey. We have both "Chickens" and "Hens". Both are ceramic and hand finished.